This is Blades of Time. It's a hack-and-slash game featuring a scantily clad woman named Ayumi and her giant gunblades. It's being developed by Gaijin Entertainment. They developed X-Blades which, if you don't remember, was also a hack-and-slash game. With a scantily clad woman. Named Ayumi. And gunblades. Contrary to conventional wisdom though, Blades of Time is not a sequel. It's just another game made by the same people with some striking similarities to its predecessor, kind of like the way my brother is just another person made by the same people with some striking similarities to me. The Ayumi in this game, however, lives in Dragonland (?! ), and her plight involves the secrets of a mysterious island cursed by a demonic force. Like in X-Blades, you'll be able to choose between two different skill trees, but instead of the "Good/Evil" abilities from that game, you'll have the magic of Order and Chaos to dabble in. 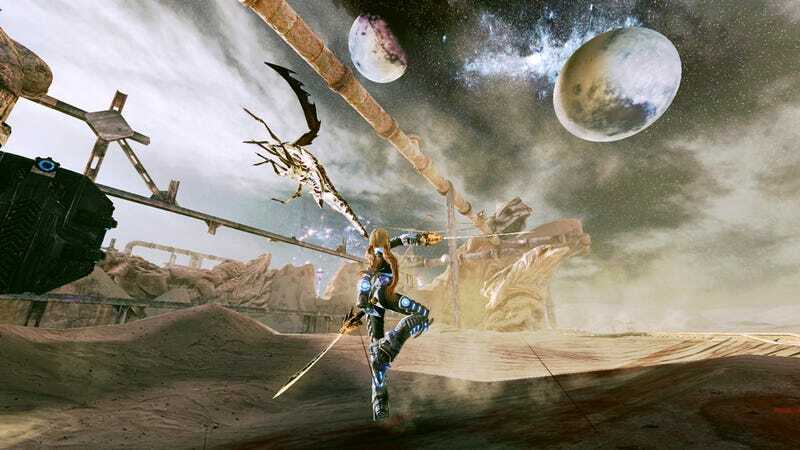 Because it can't be exactly like X-Blades, Blades of Time introduces new features like Co-Op play and promises PvP multiplayer, although how the latter will be implemented has yet to be revealed. There's also a neat-sounding Time Rewind feature that, instead of just reversing your actions a la Prince of Persia you actually get to send back a temporal clone of yourself that'll repeat your actions, kind of like in Ratchet and Clank Future: A Crack in Time but with less clothes. Blades of Time will be published by Konami for the Playstation 3 and Xbox 360 in February 2012. You won't be able to judge the game for yourself until then, but you can judge these screens. See what you think.